Jill finished the Delta Mitts by Ella Austin using Knit Picks Wool of the Andes Sport weight in Fairy Tale and Grey Heather and Blue Sky Alpacas Alpaca Sport in a purple color. Her Rav page here. 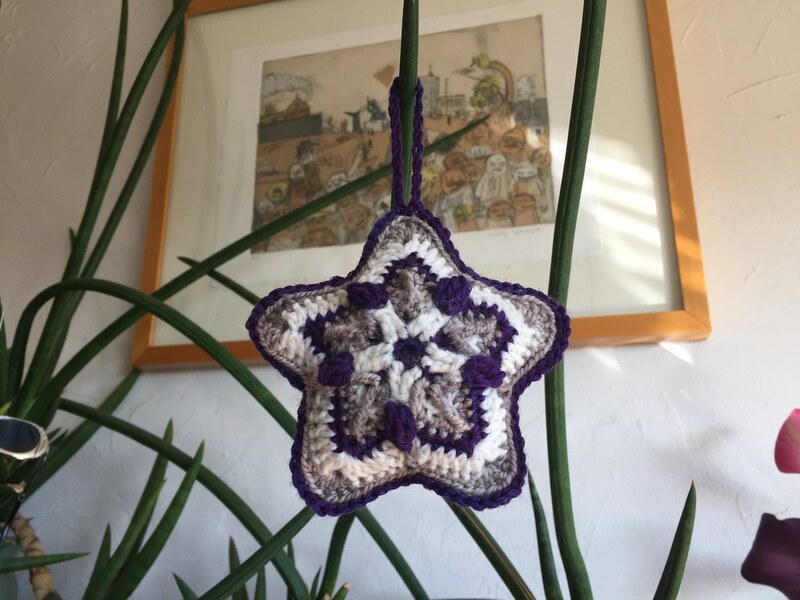 She also made an overlay crochet ornament, the Starry Dream Hanging Ornament by Lilla Bjorn Crochet using sock yarn scraps. Her Rav page here. Michele is working on the Diagonal Comfort Blanket by Lion Brand out of Red Heart with Love. She is going to use an edging from the book Around the Corner: Crochet Borders by Edie Eckman. She is using the Raspberry color, but also bought Peacock and Berry Red. Jill is working on the Aumangea Pullover by Francoise Danoy using Cloudborn Fibers Superwash Merino Worsted Twist in Grey Heather and Scarlet. She is also crocheting the Heavenly Lemon shawl by Elena Madsen out of Sanli 216 Chinese yarn in an aqua color. Jill wanted Michele's help deciding what cowl/scarf to start for the Indie Designer Gift-a-Long. She was debating the Sorcerers Stripes Scarf or Cowl by Brenda Castiel, Charadriiformes by Sarah Huntington Burch, Waverleaf by Faye Kennington, Deco Drops by Sarah Huntington Burch and Maurice by Lee Meredith. Jill also likes the Tulipa Espiral shawl by Ines Sousa and the worsted color work shawl, Azulejo Shawl by Christina Danaee. 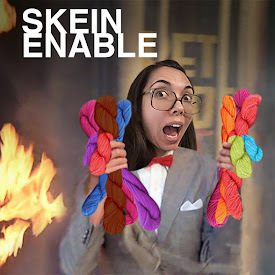 She also wants to make the Pussyhat Project hat by Kat Coyle. And the tiny Zigguratlettissimissimo sweaters by Asa Tricosa!